Hey all, my name is Kamal Yechoor, and I will be a regular contributor to Double Dribbling. A little bit about me, I've been following the NBA since I was about 3 (no joke). I've been a fantasy basketball addict since the 2001 season and my current favorite team to watch is the Portland Trailblazers. After almost a month into the basketball season, I feel its worth recognizing those players that have outperformed their expectations, as well as those perennial all-stars that are simply underachieving. 1) Nene Hilario PF/C DEN - Nene after being plagued by injuries for much of the last few seasons has been receiving a career high 33 minutes per game thus far and has not missed a game this year. He is making the most of those minutes as well, putting up career highs in PTS (15.4), REB (7.3) and BLKS (1.8). Not to mention a league-leading 63.6% from the floor and a commendable 74.6% from the line. Not bad for a guy that played only 81 games in the previous 3 seasons combined. 2) Devin Harris PG NJ - After the Mavericks spent the 5th pick of the draft on this kid in 2004, nobody ever questioned his talent, we just had never seen what he could do as a full-time starting point guard. Thus far this season Harris has exploded for over double his career scoring average with 23.0 ppg, and is averaging almost 12 FT attempts a game. Strong peripheral stats of 6.2 assists, 1.3 steals, and 3.5 rebounds a contest, have him as an early frontrunner for Most Improved player of the year. 3) Andris Biedrins C GS - Simply put, Andris has been a beast. For the last few seasons, Biedrins has struggled to find consistent minutes and was at the mercy of Don Nelson's small-ball whims. However, this year Biedrins is manning the pivot with intensity and is averaging a career high in PTS (16.6), REB (13.2), and BLKS (1.6). Biedrins has always had the potential for these kind of numbers, but his consistency this year is the key to his breakout, as evidenced by his 10 consecutive double-doubles to start the season. 1) Deron Williams PG UTAH - This one is quite obvious. This was the year Deron Williams was to take the next step to be considered with the elite point guards of the NBA, building upon his success in the playoffs last year and the Olympics this summer. However, Williams has been slowed by an ankle injury and reaggravated it by trying to come back too quickly, resulting in only two games of limited action thus far into the season. Although reports say that he will be fully healthy by the end of this week, Williams still has to be one of the biggest disappointments early this season. 2) Steve Nash PG PHX - We may finally be witnessing the slowdown of one of the fastest and most prolific point guards in recent history. While its hard to qualify per game averages of 14 pts and 8 ast as being a bust, coming off 4 seasons of double-digit assists, 8.1 apg is a dropoff. Nash's attempts from the field and the line have dropped off as well, leading to his lowest scoring output since 1999. 3) Kevin Garnett PF BOS - Similar to Nash, its hard to justify 16-8 as being disappointing, but it looks like age is catching up to the 32 year old Garnett as well. Coming off of an emotional season which gave him his first championship, KG's numbers have dropped off considerably. His points, rebounds, and assists numbers are the lowest they've been since his rookie season, and he is averaging a career low in blocks (1.1). After 14 seasons in the NBA, its hard to continue to expect superstar production from Garnett, but for those that drafted him in the first few rounds of fantasy basketball, these numbers are unsatisfactory. Rudy Gay: I was honestly targeting this guy in one of my leagues, but someone beat me to him. Don't let his current rank discourage you from trying to acquire him; he's much better than his 79th (Yahoo rank) suggests. As hot as OJ Mayo has been in his first month as a Grizzly, Gay is the go to guy on the team. Take advantage of his recent shooting slump to get him; he's bound to recover. He throws up 17 shots a game with 4+ threes (he's only shooting 24% from behind the arc this year, but he's a career 35% 3pt shooter). As the season wears on, I see OJ cooling down a bit - every rookie does. When that happens, Memphis is going to fall back on Gay. Al Harrington: Getting out of Golden State is going to work miracles for this guy. A number of fantasy owners (including myself) are probably frustrated with his month of DNP's. However, in D'Antoni's run-and-gun offense, Al has the potential to flourish. He's going to get 28+ consistently at PF and C. Act fast though, he's already played his first game as a Knick. Despite only scoring 13pts, he did collect 11 rebounds and shot the ball 16 times. Lamar Odom: Here's a suggestion I'm not so confident about, but I still feel he's worth the pick if he pans out. Odom is coming off the bench as the 6th man this year, and he's been struggling to be consistent. However, I think he's slowly adjusting to this new role. Odom still gets 25-30 mins a night, and will only become increasingly efficient in the minutes that he does get. Right now, he's averaging 10pts, 6rebs, and 2 assists. Given an adjustment period, I see him growing to around 14pts,6rebs, and 4 assists with a steal and a block. Don't throw anything huge to get him, Odom is known for disappointing owners, but I'd still be willing send some offers for him. Zach Randolph: It may be to late already, but get rid of him if you can. He may have played lights out on the Knicks, but ZBo won't see anywhere close to that level of success with the Clips. LA is already have solid big men in Camby and Kaman, both of who can rebound and defend well. Thornton is an emerging offensive force. Baron Davis will also get his shots, and Eric Gordon is getting more and more shots as well. He's going to come off the bench and give you 15pts and 6 rebs at best. Ronnie Brewer: As much as I love this guy, I'd advice trading him away in fantasy leagues. Brewer has made the most of Deron Williams's absence to show what he can do. In his last four games, his shot attempts of been 11,13,14, and 19 respectively. He's scored, pitched in some rebounds, assists, and most importantly been HUGE in steals. However, the fact of the matter is that Brewer will not get 15 shots a game once Dwill returns (tentative date this Wednesday). His recent stretch of good games won't continue. He's still valuable for steals...but shop him around right now and see what you can get in return. Nene Hilario: I was shocked to find that Nene is currently ranked 8th in Yahoo rankings. He has been surprisingly productive this year and contributes across the board in pts, rebs, FG%, blocks, and steals. The problem I have with him is that he's injury prone. In his last four seasons, he's played 55,1,64,and 15 games. It's true that many of the injuries like his thumb and calf injuries may have purely been bad luck, but it's bound to happen again. Sell him while his value is still high. Russell Westrbrook(owned in 30% of Yahoo leagues): The Thunder's replacement of P.J. Carlesimo with Scott Brooks is beginning to show off the potential of this first round draft pick. Brooks has been playing much more small ball, allowing OKC to play both Earl Watson and Westbrook at the same time. Westbrooks's minutes have steadliy been growing, and now it looks like he'll get between 25-30 mins a game. Despite only shooting 31% from the floor, he still gets a good 12+ shots a game. Additionally, both his assists and steals have risen. Pick him up right now if he's available. Andray Blatche(owned in 11% of Yahoo leagues): Blatche started off the year with promising potential, but soon after found himself in Eddie Jordan's doghouse. Fortunately for him, Eddie Jordan got fired, and interim coach Ed Tapscott may give him another chance to prove himself. The only competition at the center position in Washington is veteran Etan Thomas and rookie Javale Mcgee. I don't see Washington using Thomas as anything more than an energy backup, and though Mcgee shows promise, I don't think he's strong enough yet to take over. Both Blatche and Mcgee will split minutes at center, but Blatche has more experience and an NBA ready body. He's worth a pickup in deeper leagues. Darko Milicic(owned in 8% of Yahoo leagues: Don't look now but we've just had another Darko sighting. Milicic put up 11pts, 11rebs, and some blocks in his latest game. If you're extremely weak at the center position, Darko is worth a look. This is definitely not a for sure recommendation, but definitely keep an eye on him. I haven't given up on this guy yet! 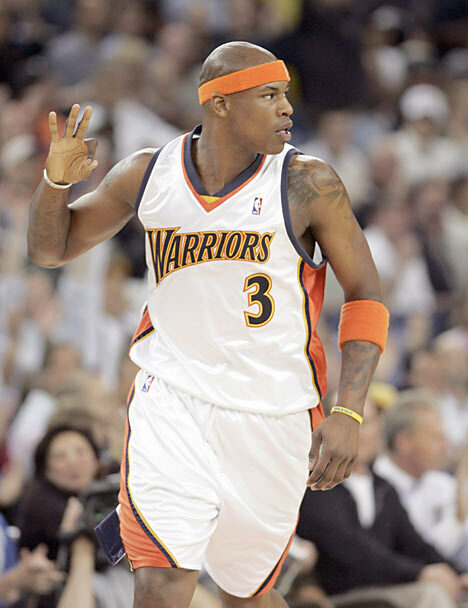 The New York Knicks have dealt shooting guard Jamal Crawford for Golden State's Al Harrington. Crawford, a high volume perimeter gunner goes from one up-tempo team to another. After losing Baron Davis over the summer, and Monta Ellis to a moped injury before training camp, Golden State was in desperate need of someone to pick up some scoring responsibility behind SJax and Corey Maguette. Crawford immediately adds another scoring threat to Golden State's offense. Though in no way a point guard, Crawford can take over some primary ball handling duties as well. Al Harrington has been in Don Nelson's dog house for the majority of the season. This trade comes as a much welcomed change of scenery for Harrington (and all fantasy basketball players that own him). D'Antoni's run-and-gun style of play is perfect for Harrington; he's an undersized power-forward with above-average scoring abilities, but a poor defender and rebounder. It will be interesting to see how playing time works out in New York with David Lee, Wilson Chandler, and Zach Randolph playing a similar position. More importantly, this trade freed up cap space for the Knicks in 2010 to make a run at the ridiculous free agent class include Lebron and Dwayne Wade. As for Golden State, they seem to be more concerned with the current year's playoff run. Jamal Crawford's role in Golden State will remain pretty much unchanged from his situation in New York: He will called on to score. However, beware of some consistency issues, especially when Monta Ellis returns; Golden State has a number of proven scorers, all who require lots of touches to be effective. Al Harrington - Like mentioned above, this trade comes as a godsend. Harrington has been piling up the DNP's because of his issues with Don Nelson. Though the Knicks still do have Lee, Chandler, and ZBo, I expect Harrington to jump in and resume regular levels of production. Expect around 14-16ppg, 5 rebs, and a three pointer in about 28 mins on most nights. Nate Robinson - Look for his value to go up. Robinson can put up points in bunches and the back court just opened up for him to start raining shots. The Knicks just lost 19points a game; Nate will fill in for a lot of those. Anthony Randolph/Brandon Wright - I don't know how effective either of these guys will be, but getting rid of Harrington shows a commitment from Golden State to these young guns. Keep an eye out to see who takes advantage. Expectations for this team have been brewing and building for a while now, and it would be wrong for me to call Portland a "surprise" team in any sense; this ball club has received its fair share of recent hype. If you just took a look at their 2-3 record, it would be easy to to consider all the hype surrounding them unwarranted. In addition, they're still a very young team, have no superstar (Roy isn't there yet), and have an unproven/rookie (and injured) starting center. However, if you turn on the TV and watch a Blazer's game, these flaws suddenly don't seem quite as important. Though at times wild/erratic, these guys play with passion and energy. Offense isn't just ISO-ing one guy on the wing and depending on him to score. Each guy is willing to make the extra pass. No one is flopping around trying to draw stupid fouls. The Trailblazers do all the little things that make basketball fun to watch. Now I know that an exciting team doesn't necessarily make a good team, and this ball club's success is anything but certain given the competitive nature of the Western Conference. But here's why I think the Blazers will succeed this year: depth. Portland has a glut of talented players that can play multiple positions. While this year it looks like Blake handles primary point-guard duties, Brandon Roy and Rudy Fernandez are both capable ball-handlers. Sergio Rodriguez is also a high-energy sub that provides a nice boost of the bench. Let's also not forget Jerryd Bayless, the quick-footed summer league standout who could receive a chance to prove himself later on in the season. On the wings, they have Brandon Roy, Travis Outlaw, Martell Webster, and Rudy Fernandez. These guys provide the bulk of the scoring, and a nice inside-outside threat for the offense, each capable of penetrating and shooting the three. Portland's frontcourt is questionable, but has great potential. Lamarcus Aldridge has been solid since entering the league in 2006. He's a legitimate inside scorer and an adequate shotblocker. Greg Oden is athletic, but raw, unproven,and injury prone. However, if he develops his offensive game some more and can stay healthy, he and Aldridge will be a scary tandem in the middle. Brandon Roy - Roy needs to be solid and consistent for this team to reach the next level. He needs to be able to handle the pressure of being the goto guy. Rudy Fernandez - I hated him when he posterized Dwight Howard in the Olympics, but I'd be lying if I said I wasn't impressed. Rudy is instant offense, an European high flier/gunner that can score from anywhere on the floor. I can only see good things happening if Nate McMillian gives him consistent playing time. Not only will the Trailblazers make the playoffs, they're going to pull a first round upset. Think Golden State Warriors circa 2007 playoffs. Lebron to Detroit in 2010? After reading the million-and-one breakdowns of the Iverson-Billups trade. Yahoo writer Adrian Wojnarowski has come up with an interesting look into the deeper implications of the trade. This right here, is why us fans in Detroit love Joe Dumars; this guy always has something up his sleeve: a hidden plan. While the majority of the basketball world is looking at how Iverson will fit into the Pistons, or whether or not Billups will be able to carry the Nuggets, Dumars is sitting in his office looking to lure (arguably) the best player in the NBA. Think about it; the Iverson deal is actually genius. Regardless of how well he fits in...he is still ALLEN IVERSON. The Pistons have too much talent on the team to fall too far. At worst, Detroit loses in the second round of the playoffs. I even dare to say that Detroit would make a second round appearance without AI or Billups; Hamilton, Sheed, and Prince are strong enough to carry the team that far in the Leastern Conference. I won't go into detail over the relations Joe Dumars has with Lebron's agents. Go read the linked article, it makes this trade sound that much more appealing. So as of now, the Pistons have a superstar tapering to the end of his career joining a very strong core of players. By the time 2010 comes around, the Pistons still have Hamilton, Prince, and more matured versions of Stuckey, Maxiell, and Amir. What other organization has this type of team to offer Lebron in 2010? Whether or not they win the championship this year, the Pistons will remain highly competitive while positioning themselves to adjust for the future. Gotta love Joe D.
Now this comes somewhat as a surprise. For a moment there, it seemed like Joe Dumars was ready to give the Piston's core one last shot at getting the title. ...guess that's not the case. As much as I loved Billups, this move was a much needed move. Despite having a new coach in Michael Curry, the Pistons essentially had the exact same players return for the 2008-2009 season (with the exception of Kwame Brown). With Iverson, the Pistons have now added versatility to their backcourt. I'm assuming AI will start at PG, leaving Hamilton at the SG, Prince at SF, Amir at PF, and Wallace at C. However, if the Pistons want to play small ball, they can shift AI to SG and play Stuckey at point. Amir gets bumped out leaving Prince to play PF. AI is also that guy that can single handedly bring the Piston offense out of the bog-downs that always seem to hit them during crucial games. His quickness, slashing, and ability to finish consistently around the basket is something the Pistons haven't had for a while. Iverson, being at the latter end of his career, knows that he has to do whatever he can to attain that championship that has eluded him his entire career. Now he has the chance to do so. Billups, a Colorado native, provides the Nuggets with playoff experience, stout defense, and much needed floor leadership. Mcdyess (and Samb) also adds some depth to the Nugget's thin front line. Chauncey Billups's value is going to go up. Billups, though consistent, has been in somewhat lackluster the past season. The change of scenery will revitalize him (and his stats). In Denver, he will be counted on to score and distributed much more than in Detroit (where one off-night was made up for by one of the other three starters). I predict his points will go up, while maintaining assists, and adding some more three pointers. Allen Iverson's value is going to drop...but only by a bit. Detroit doesn't need him to score as much as Denver did. Joe Dumars's utter confidence in Stuckey also shows that Iverson won't need to play PG the entire time as well. Thus, I foresee a slight drop in both points and assists. Jason Maxiell/Amir Johnson These two will rise in value purely because Detroit is less one big man. Mcdyess's minutes have to be redistributed amongst the two. Keep an eye on these two to see who benefits the most. Welcome readers to my Basketball blog. Here you will find my commentary and analysis on various events and games of the National Basketball Association. As an avid follower of the NBA, I also participate in Fantasy Basketball. Thus, I will also be regularly updating with Fantasy Basketball news: players I like, those I don't, etc. I hope you enjoy.